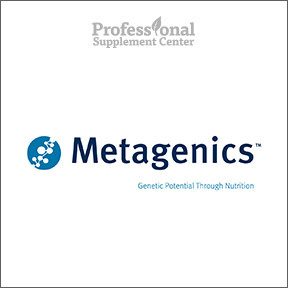 Since 1983, Metagenics® has been dedicated to helping people live healthier lives by realizing their genetic potential through targeted nutrition. By providing research-based medical foods, nutraceuticals and turnkey programs, Metagenics® aids healthcare professionals in addressing a higher level of personalized wellness care for their patients. In order to provide their innovative formulas, Metagenics’ committed in-house scientific staff utilizes the latest genomic and proteomic research. Their carefully designed, advanced, effective compounds live up to their scientific promise and deliver on their potential through careful examination at every stage–from formulation to ingredient selection to quality assays to manufacture in their own technologically advanced facilities. Metagenics® has achieved three independent certifications for Good Manufacturing Practices (GMPs). Additional in-house testing and third party assays by respected independent laboratories well exceed GMP quality control criteria. Metagenics’ very high standards ensure ingredient safety, proper ingredient identity, purity, quality and bioavailability for reliably effective use. Metagenics® believes that when it comes to your best possible health, you can take control of your own destiny with a healthy lifestyle and targeted nutritional support. OmegaGenics® EPA-DHA 720 – This very popular, 5 star-rated formula provides a concentrated and balanced blend of pharmaceutical grade omega-3 essential fatty acids in triglyceride form for easy absorption. Produced from sustainably sourced fish in a licensed Norwegian pharmaceutical laboratory, this premium formula supports healthy blood lipids, cardiovascular health, positive mood and overall health. Gluten free, Non-GMO. Estrovera® – This highly effective, exclusive patented formula provides clinically proven, non-hormonal menopausal symptom relief. Scientifically validated for safety and effectiveness, Estrovera® provides natural relief from hot flashes, sleep disturbances, mood swings and irritability. Gluten free, Non-GMO vegetarian formulation. Cal Apatite Bone Builder® Forte – This 5 star-rated formula provides a full spectrum of macro and micro minerals in support of bone mineral density. Backed by more than 30 years of research, this gluten and soy free, Non-GMO formulation provides premium quality MCHC, vitamin D as cholecalciferol, bioactive bone growth factors, naturally occurring calcium, phosphorus and vital bone proteins for enhanced bone nourishment. This entry was posted in Home and tagged Cal Apatite Bone Builder Forte, Estrovera, Metagenics, OmegaGenics EPA-DHA 720, Professional Supplement Center, Vitamins and supplements, www.professionalsupplementcenter.com. Bookmark the permalink.